Crude oil benchmark Brent futures have finally touched US$50 a barrel again as energy prices continue a slow climb out of the doldrums. And pump prices in Singapore are edging up too. At Shell, for instance, FuelSave98 is $2.28 a litre without discount, up from $2.22 a month ago. FuelSave95 rose to $1.95 from $1.89 in the same period. Analysts said recent crude price gains were caused partly by temporary factors - and the recovery will stay uneven in the months ahead. But they added that the market is slowly heading towards a balancing of supply and demand. Brent futures broke above the US$50 line in early trading yesterday - the first time since November - and settled at US$50.16 a barrel in the evening, its highest since reaching US$50.54 on Nov 3 last year. It has been a long and at times wobbly rise, but Brent has now shot up about 80 per cent from the multi-year low of US$27.88 on Jan 20. US$50 is seen as a market resistance level, and the price rose amid reactions to a surprise drop in US stocks, CMC Markets analyst Margaret Yang said. "The weekly US Department of Energy crude inventory report shows a drop of 4.2 million barrels from a week ago. This gave a short-term boost to market sentiment," she said. "I think oil prices may have overrun, and we may see some profit- taking after this. The recovery in the second half will be volatile, and I expect Brent to stay range-bound and end the year not far from the current levels." The Organisation of the Petroleum Exporting Countries' meeting next week may prove disruptive if a consensus on production curbs is not reached, she said. Bank of Singapore chief economist Richard Jerram said: "The impact of the temporary factors, including also the supply disruption in places like Canada and Nigeria, will taper off. In six months, I don't see prices significantly away from where they are now." But a balance of supply and demand necessary for the full recovery of oil markets is slowly coming into sight, he noted. "While overall inventories are still very high, demand has been picking up for about a year now, and the long period of low prices has also led to a curtailment of production, particularly that of the US shale sector. The rig count in the US has also dropped about 80 per cent since late 2014. "Most analyses put the balancing point at about US$60 to US$70, not too far from what we have now." 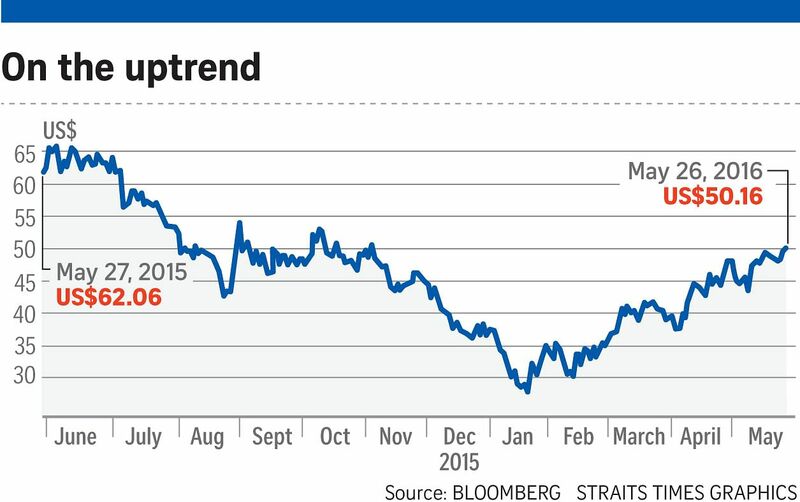 The recovery for the offshore and marine firms in Singapore may, however, come much later. Maybank Kim Eng analyst Yeak Chee Keong said: "There's no magic number that you can look at and say the offshore and marine sector is out of trouble. What we need is to see a very sustainable recovery that can induce confidence for oil producers to raise their capital expenditure again." As for local motorists, consultant Wayne Koo, 43, said: "I think the stations keep the final prices steady by controlling the discounts. And when the crude oil prices were crashing last year, we also didn't enjoy the same drop. So I've never felt that much of a difference."